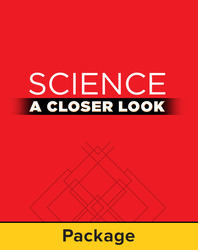 These large-format books support science instruction through a shared reading experience. These reproductions of the On Level Science Leveled Readers feature colorful illustrations and motivating photographs, and allow for whole class instruction. This set contains the Life Science Literature Big Book, the Earth Science Literature Big Book, and the Physical Science Literature Big Book.